Puzzle-platformer due out in limited and standard editions. A Rose in the Twilight, released as Rose and the Old Castle of Twilight in Japan, is coming to North America and Europe both physically and digitally for PS Vita, and for PC via Steam in spring 2017, publisher NIS America announced. In North America, the $19.99 standard and $39.99 limited edition will be available exclusively via the NIS America Online Store. In Europe, there will only be a limited edition version of the game, also available exclusively via the NIS America Online Store. The limited edition includes a copy of the game, premium box, 15-track soundtrack CD, 36-page soft cover art book, five-inch Giant stress ball, and Rose rubber strap. A girl awakens in a castle void of color and time, affixed with the Curse of Thorns upon her back. After meeting a sleeping giant, the two work together to escape. Help them unravel the mystery of the thorns and the history behind the sombre castle. 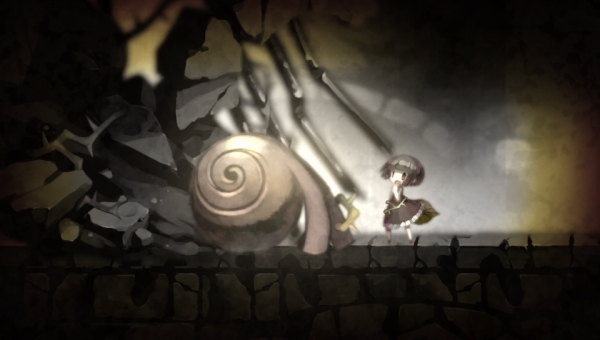 In A Rose in the Twilight, use Rose’s power to absorb blood and transfer it to static objects. By doing so, colorless objects become red and regain the essence of time. You will also need to make use of the giant’s super strength by lifting and throwing objects to clear your path. Every stage is a puzzle waiting to be pieced together. The further you get, the harder it becomes, but the greater the risk, the bigger the reward. Discover how to solve each stage as you delve deeper into the story’s grim origins.